How is Australia to handle an otherwise ageing (historically white) population in a highly mobile world? The answer seems locked as ever onto modes of control, but also lately welded onto a transactional mentality that is incoherent. New South Wales premier Gladys Berejiklian called this week for halving the state's migrant intake. Federal minister for cities Alan Tudge proposed a mandatory five-year regional settlement scheme for migrants. Both have left policy observers scratching their heads. The highest proportion of net overseas migration is in the higher education sector, according to Guardian analysis. Setting aside serious questions around a model that relies on fee-paying students, Australian universities in major capital cities are being propped up by international students. The cash injection to universities — at $6.2 billion nationally — is significant, but not limited to this area. Students are renting, buying, and paying for services. Education as an export earns more than tourism, running third behind iron ore and coal. So here we have a situation where governments have slashed higher education funding, prompting university reliance on foreign students for revenue, which drives (and has coincided with) a competitive international market for Australian degrees, leading to resident population growth that is inextricable from an economic bump — and the premier wants to halve migration levels. I'd rather not mention that the bulk of international students come from Asia, particularly China and India, but there it is. Is it worth asking if the problem would have been better framed around infrastructure spending rather than population growth, if most migrants come from Ireland or (white) America? Maybe. In election season, it is not unusual to see a spike in concern about matters like roads, public transport and housing supply. These are governance issues worth attention. But they have also become a proxy language for population control based on other motives. "This is how perversely we think about people who arrive here: we say they have created problems for which they are the solution." Drastically limiting migrant intake starts sounding less racist and more sensible if you talk about traffic and rent, suggesting that there are just too many people out there. These pressures are of course real. However, without accounting for the positive GDP impacts of immigrants — particularly skilled workers who contribute more to fiscal revenue than they draw on public services — as well as inadequate, overdue infrastructure spending, the opportunity for blame is also real. This becomes clear in the push to stream migrants to regional areas. It is usually pitched as a neat solution for urban congestion and regional underdevelopment. But what it really means is that new migrants are being made to patch up historical neglect in infrastructure on both sides. This is how perversely we think about people who arrive here: we say they have created problems for which they are the solution. The proposed regional settlement scheme invites an endless series of questions. Are there even jobs for migrants in regional areas which they won't get accused of stealing? How would visa conditions be enforced? If someone lives in a regional area but catches a train to the city for work, does that count as a breach? What happens if they or their children fall ill and must stay in the city for some time to access specialists? How would you even track movement — would migrants be treated like they are on parole for five years or would real estate agents be deputised? Given certain policy trajectories in surveillance and record-keeping, these aren't unthinkable. Would a government that quarantines a life to a geographical area for five years (at least for now) be willing to provide the necessary supports for it? Or would it leave that responsibility, as it has in many instances, to resource-poor communities? And what would it have to say to residents in those regional communities, who might find the change in population as disconcerting as their counterparts in urban or suburban areas? Would politicians frame this change as beneficial to all — which they have never done? Or would certain MPs and senators find opportunity again to harvest resentments? 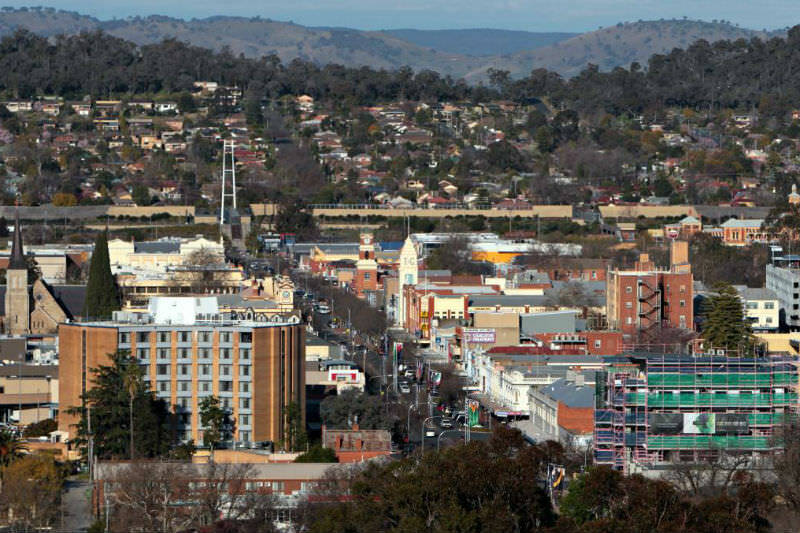 Main image: The regional city of Albury. Thanks Fatima. You make good sense. The politicians’ outburst seems to have been a knee-jerk reaction. We can ask- where is the policy? Where are the policy-makers? My understanding is that our federal bureaucrats (who I believe would know) argue for an intake of more than 300,000 a year as desirable. I live in a smallish regional community. If a significant number of migrants or refugees came to live here, here are the benefits I envisage for both the current and future residents. For the current residents a new landscape, new cultures to learn about, new friendships to forge and new playmates for children. For the newcomers, people who recognise you and say hello when you walk down the street, a community who will pitch in to help when you get into difficulty and the best beaches in the world to walk along. There's not an abundance of jobs but, over the years I've lived here, many new businesses have opened, and there are pathways to employment. One can strongly agree with a major reduction in the high levels of immigration in recent years (supported by the Coalition, Labor, and the Greens - and of course by the almost all-powerful "developers") without being "racist", without thinking moving people to the country is a practical solution, without wanting any reduction in the relatively small proportion of immigrants who are refugees (their number increased by the present Government), and without supporting the appalling policies relating to Nauru and Manus (and the Government's refusal to take responsibility for the conditions there). There are limits to a sustainable population in Australia - as there are to population on this planet with its finite resources, as Sir David Attenborough among so many points out. If I vote, it will be for Sustainable Australia. It has moderate centrist policies and a sane policy on immigration. The effects of excessive immigration are evident all around us in Sydney - in relation to transport, hospital services (the area where I myself volunteer), agriculture, educational facilities, and the degrading of the natural environment, and even without a single more immigrant, they will only increase in the future. But I am not hopeful. T.S.Eliot said something like humankind cannot bear very much reality. It would be great if both state and federal governments de-centralised all their departments and other facilities to out lying towns and centres so that they can use these workers well away from the highly populated cities - provide jobs and accommodation well away from the over populated Sydney and other capital cities. This would also greatly help those reginal areas which need support. John B. Wilson. Very telling comments, Fatima. Unfortunately, the incoherence of our MPs' mentality is not confined to the matter of population policy, or its subset migration policy. Knee-jerk reactions, floating of "thought bubbles" (especially near the time of elections or by-elections) and lack of any visionary long-term thinking are the order of the day, and appear likely to get worse. I wish I had the word-space and time to take up specifically your references to education and overseas students, not because I am against them at all, but because the ramifications of the last thirty years of transforming tertiary education into an economic enterprise have received very little attention among either the politicians or the general public, and this is a much broader issue than one of immigration policy. Thank you Fatima for your thoughts on Australian politicians' attitudes towards migrants to this country - including asylum seekers and refugees. I think that given her political affiliation we should not be surprised that Gladys Berejiklian is pushing to lower the numbers we take in Australia. However, it is rather ironic given that she comes from a family who became migrants because of the Armenian Genocide and armed conflict in Syria. In fact, in May this year, Gladys Berejiklian addressed the right wing Sydney Institute on her family's experiences. One wonders if she has tried to persuade her federal colleagues in the "Liberal" Party to show more compassion and humanity towards asylum seekers rather than using them as "political football" as they have been doing for many years as have ALP governments. As a number have pointed out, her statement probably had a lot to do with getting support from voters who are opposed to immigration in the lead-up to the next NSW state elections. And I agree with those who point out that before we can expect large numbers of migrants to go to regional Australia, we have to build up infrastructure and government and other services before this can be done significantly in a big way. However, in some places - eg Murray Bridge in SA - many asylum seekers have gone their to work and they are appreciated by the local community. To those who use the care of the environment as a reason for not having more migrants, it should be said that we need to view this issue as a global concern. Obviously, there are many parts of the world that are getting to be over-populated, so there has to be very careful planning for the relocation of people. When it comes to people who have become refugees because of conflict, persecution or natural disasters, surely we can agree that as citizens of the world, they have the right to resettle somewhere else. Many conservative Australian politicians who complain about the fairly small numbers of asylum seekers who have come to our shores, in many cases have been the ones who have got us involved in the some of the wars and repressive situations that caused these people to become refugees. Many of problems are due to Australia getting involved in conflicts started by the US, so if we want less refugees we need to be pushing for a free, independent and non-aligned Australia. Apart from causing great carnage, human suffering and destruction to infrastructure, wars also cause great damage to the environment. If Australia did become non-aligned, we could play a much more positive role in working for peace, caring for the global environment and the people who live in it.